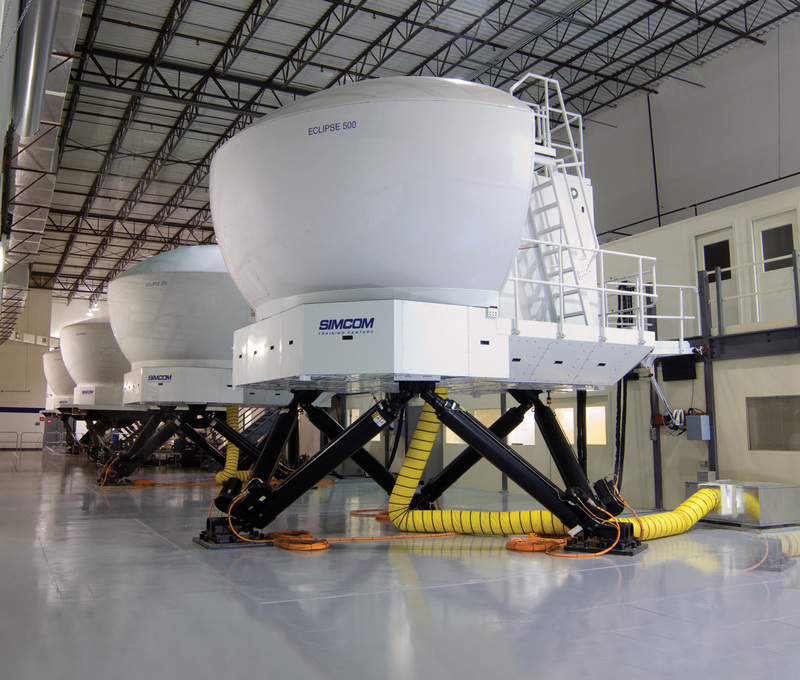 Eclipse Aerospace has placed an Eclipse 550 simulator with SIMCOM at their Orlando, Florida facility. The Simulator is a full motion level-D simulator that is equipped with AVIO IFMS avionics. The simulator located at the Orlando SIMCOM facility is used for both the Eclipse 550 and the Eclipse 500. The simulator is used for both aircraft because they are almost the same aircraft. The Eclipse 550 is built on the Eclipse 500 certificate and is a continuation of the original Eclipse Jet. On June 6th, 2013 the full motion simulator with AVIO IFMS became available for training. The simulator's cockpit is very identical to the Eclipse 550's cockpit. SIMCOM is the official training provider selected by Eclipse Aerospace to provide training for the jet. They provide full simulator training for the very light jet as a part of their training programs. SIMCOM is the only provider to have an Eclipse 550 simulator at this time. FlyRadius has not spotted any other companies having a simulator for the Eclipse 550. More information on traning for the Eclipse 550 can be found on our Eclipse 550 Type Rating – Training page (coming soon). There is a simulator model of the Eclipse 550 for X-Plane available. It is on the x-plane.org forums and is free, however it is not an accurate representation of the Eclipse 550. The Eclipse 550 simulator model is made by Aerobask. If you are familiar with the Eclipse 550 very light jet, you will find this simulator model is not a close representation of the aircraft. The simulator model is actually a more accurate depiction of the Eclipse 500. The avionics on the simulator show an old version of AVIO and not the AVIO IFMS system that the Eclipse 550 has. 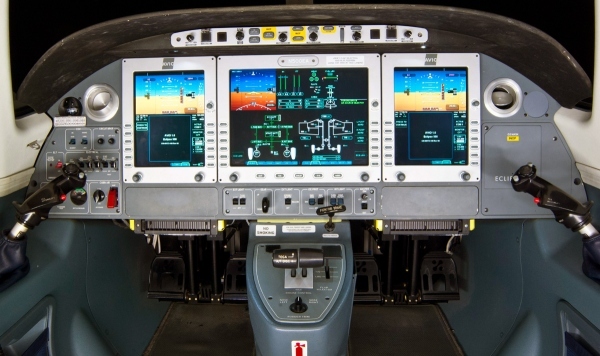 It has the Garmin GNS 430s that some Eclipse 500s have as a fix to integrate navigation into the old avionics system. Also the seats in the model are from the original Eclipse 500 and are not the new seats that the Eclipse 550 has. There is an "Eclipse 550 simulator" available for X-Plane, however if you are looking for an accurate representation of the jet it is not available yet. We have not spotted an Eclipse 550 simulator for Microsoft Flight Simulator X or Lockheed Martin Prepar3D. Prepar3D is the continuation of Microsoft's simulator system (Microsoft ESP technology) that is geared toward professional simulation flying. Also if you want to learn about the history of the simulators for the Eclipse jet program also check out the Eclipse 500 simulator page. Above is a photo of the Eclipse 550 simulator at SIMCOM Orlando. The photo is not an updated one with the new AVIO IFMS avionics. Photo Copyright SIMCOM, used under the fair use provision. Above is an outside photo of the full motion simulator for the Eclipse 550 jet. Photo Copyright SIMCOM, used under the fair use provision.